Chevak Cupʼik or just Cupʼik (and sometimes Cugtun) is a subdialect of Hooper Bay–Chevak dialect of Yupʼik spoken in southwestern Alaska in the Chevak (Cupʼik, Cevʼaq) by Chevak Cupʼik Eskimos (own name Cupʼit or Cevʼallrarmuit). The speakers of the Chevak subdialect used for themselves as Cupʼik (as opposed to Yupʼik), but the speakers of the Hooper Bay subdialect used for themselves as Yupʼik (not Cupʼik), as in the Yukon-Kuskokwim dialect. The Central Alaskan Yupik who in the village of Chevak call themselves Cupʼik (plural Cupʼit), whereas those who live on Nunivak Island (Nuniwar in Nunivak Cupʼig, Nunivaaq in Central Yupʼik) call themselves Cupʼig (plural Cupʼit), the spelling differences serving as a self-designated cultural identifier between the two groups. In both dialects, the consonant Yupʼik c is pronounced as an English ch. The Cupʼik dialect is readily distinguished from other dialects of Yupʼik in the pronunciation of Yupʼik "y" sounds as "ch" sounds (represented by the letter "c"), and by some fundamental differences in the basic vocabulary. The oldest fully bilingual person in Chevak is Leo Moses, born in 1933; there are few if any persons born after 1945 who do not speak English. The first documentation of the Hooper Bay-Chevak dialect (beyond occasional citations) is found in the unpublished notes of Jesuit priests residing ay Hooper Bay and Kashunuk in the 1920s and 1930s. Published recognition of Hooper Bay-Chevak as a morphologically distinct dialect of Yupʼik seems to begin with Michael E. Krauss in 1973, although the fundamental differences between the dialects were common knowledge among native speakers. Cup'ik is a critically threatened language, and English the primary language of everyday communication among most of those with knowledge of the language. 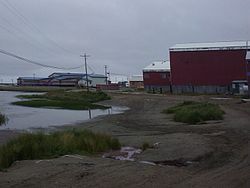 Their unique cultural and linguistic identity has allowed them to form a single-site school district, the Kashunamiut School District, rather than joining a neighboring Yupʼik school district. English and Cupʼik bilingual education is done at this school. There is a tri-language system in Chevak; English, Cupʼik, and a mixture of the two languages. Before 1950 formal education for students in Chevak took place in the Qaygiq (semi-underground men's community house), and in the homes of the people. The comparison of some words in the two dialects. There are 18 letters used in the Cupʼik alphabet: a c e g i k l m n p q r s t u v w y. These letters are not used in the Cupʼik alphabet: b d f h j o x z. The Russian loanwords used in Chevak Cupʼik date from the period of the Russian America (1733–1867). ^ a b c Woodbury, Anthony Cabot (1981), Study of the Chevak dialect of Central Yupʼik Eskimo. Ph.D. dissertation, University of California, Berkeley. ^ Woodbury, Anthony Cabot (2002). "The word in Cupʼik". In Dixon, R. M. W. and Alexandra Y. Aikhenvald (eds.) Word: A cross-linguistic typology, 79-99. Cambridge: Cambridge University Press. ^ Krauss, Michael E. (1973). Eskimo-Aleut. current trends in linguistics 10, ed. by Thomas a. Sebeok, 796-902. The Hague: Mouton. ^ David A Peterson (1991), Russian loan words in Central Alaskan Yupik. Fairbanks, Alaska, April 1991. This page was last edited on 13 February 2019, at 05:19 (UTC).